Oh, San Antone. The only city where you can float on one river, then go enjoy live music and incredible food on another, drink beer from inside the silo of an old brewery, eat the best puffy tacos on the planet and then go see an NBA game, all in 12 hours. As one of the largest cities in the country, it might seem a little overwhelming for a weekend trip. But for the fourth time in twenty years, the Final Four is being hosted by the Alamo City. With the convenient design of Downtown, the Pearl Brewery, the hotels and the Alamodome, San Antonio is very Uber-friendly and possibly walkable for most events downtown. If you arrive Friday and have the day to discover, the downtown area offers a lot of history. 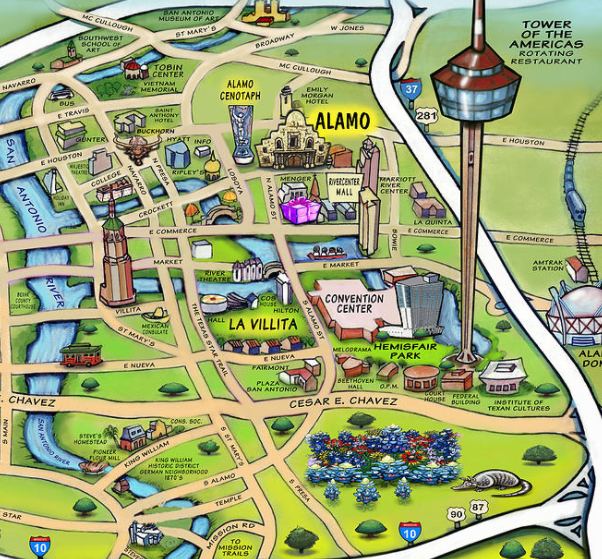 It’s the ideal location for your hotel especially if you plan to make the walk to the Alamodome. But before the games begin, here are a few suggestions. You can’t visit the Alamo City without well, The Alamo. Tours are available all day and it’s a frequent tourist photo-op just out front. Just across the street and down a level is the San Antonio Riverwalk. Daytime margaritas at Rita’s on the River or table-side guacamole from Boudro’s are the way to go for lunch on the Riverwalk. This area tends to be a place locals stay away from due to the heavy tourist impact, so if you want to do as the locals do, have lunch at The Original Blanco Cafe located on N. St. Mary’s Street, just above the river. Order puffy tacos at this no-frills spot and your mouth will thank you. If the family is tagging along for the trip to the Alamo City, take a visit to one of the three amusement parks, Six Flags Fiesta Texas, Sea World San Antonio and Schlitterbahn, the #1 water-park in the world just up the road in New Braunfels, Texas. Soluna, located in the swanky Alamo Heights neighborhood. Order the Enchiladas and if you’re of age, a Chispa to drink as well. But warning, you’re capped at 2. Paloma Blanca, located on Broadway Street and not too far from downtown, this upmarket Mexican cuisine also includes gluten-free & paleo options and a popular patio. Ocho at Hotel Havana, Pan-Latin food for chic riverside views in one of the cutest spots that is also home to my favorite mojitos in the city. la Focaccia, if you want a break from tacos, tacos and more tacos, this Italian spot on S. Alamo Street is relaxed and boasts tons of windows with excellent seafood, wood-fired pizzas and more – plus South Texas in April is the best time to sit on a patio. Southerleigh, located in the culinary center or Pearl Brewery highlights the Texas cross-cultural cuisine and the on-premise brewery offers a rotating array of original recipe, craft beers from Brewer, Les Locke. On Saturday morning, start your day with brunch at Cappy’s in Alamo Heights, Mad Hatters or Down on Grayson at the Pearl Brewery and walk through the Farmer’s Market. The Pearl Brewery is the top culinary and cultural destination in the city. It hosts the Culinary Institute of America and prior served as the home of a brewery boasting names like Pearl, Pabst Blue Ribbon and more from 1883 to 2001. Pearl is the perfect embrace of the modern restaurants and shops of San Antonio while mixing in the historic architecture of San Antonio. A must-stop at some point during your weekend is Hotel Emma. The award-winning hotel hosts 142 boutique rooms and made the Harper list as one of the top two hotels in the United States. The restaurant in the lobby, Supper, also boosted Hotel Emma into the Food & Wine Magazine’s Top 40 “food-centric” hotels. If Supper is fully booked, grab a drink at Sternewirth in the lobby. This swanky bar lets you sit in one of the old silo’s and sip a cocktail. A great and popular spot before Spurs games or events at the Alamodome. You’re sure to enjoy the company of all four final four team’s fans at this popular spot. Other bars nearby include Blue Box, La Gloria and Down on Grayson, all in the highly suggested and repetitive Pearl Brewery area. If you’re looking for something to do Sunday, there’s another arena a short three miles down the road where the best team in the NBA, statistically, this year comes to play the in-state rival and the best team NBA, statistically, in the last decade. Spurs v. Rockets tips at 2:30 local time, Sunday. As a local, I can confirm, San Antonio has seen a lot of memorable sport’s moments – and most if not all include the silver and black. The San Antonio Spurs have seen George Gervin hold on to the NBA Scoring Title, they’ve seen five NBA Championships and the greatest power forward to ever play retire after nineteen seasons. But with their fourth Final Four hosting in twenty years, they’ve also seen a lot of great college basketball moments as well. So, Saturday night when you make your way over to the newly renovated Alamodome, you might be shocked by the size. So from a local, I hope you enjoy the quiet, humble, small-town feel in an under-the-radar city that actually triples the size of Atlanta with a commanding level of achievements behind it. Like the quiet dynasty the San Antonio Spurs have become, the city is here to welcome you with few complaints and a lot of culture. If you still need tickets to the Final Four in San Antonio this weekend, you can see options here. If you need tickets to the Houston Rockets at San Antonio Spurs game on Sunday, you can see options here. If you have questions/comments about this post, please feel free to email me directly at Shannon@ticketcity.com. I am happy to help with arrangements or suggestions. I hope you enjoy my hometown!